You’ve heard me use the term a lot: Modern Mystic. Maybe you’ve even joined my free Facebook group for Modern Mystics. Or, maybe you took me up on my offer last week to try The Modern Mystery School for seven days for only $1. But, what is a Modern Mystic? First, I’m guessing that since you’re here with me, you’re interested in all of our favorite things like yoga, astrology, chakras, alchemy, spirituality, philosophy, mythology, and the practices that pull these together into personal rituals for self-discovery. A Modern Mystic is one who is interested in looking at the world from a mystical perspective in a modern day context. Much of the wisdom that we pull from as mystics is ancient, or from a culture other than our own. While it is powerful, sometimes it needs to be retranslated for our time, and who we are now. Plus, the desire for us to be individuals, to succeed on our own terms, means that what we do as a spiritual practice must be our own. A one-size-fits-all approach doesn’t work for us anymore. A mystic is one who looks at spirituality on his or her own terms, seeing everything around them as a reflection of their own soul’s landscape. A mystic negotiates his or her own relationship to source…no guru, or intermediary needed. A mystic does need a tribe, though. And, who better than like-minded souls to commune within the search for one’s own personal bliss? And, so, the Modern Mystic is born. It is a term that speaks to your needs as a powerful, contemporary individual spiritual thought leader. And, it is a term that describes our tribe: the fellow mystics who are interested in learning the variety of traditions needed by today’s spiritual torchbearers. I developed this community to serve you. To bring us together. To support us all in our individual soul’s growth. As a part of that, I pulled together some of my most popular courses into The Modern Mystery School membership, giving you access to over 150 hours of higher education in your favorite topics – astrology, chakras, spirituality, yoga – for one low monthly price…only $147/month (that’s a savings of more than $1500!). Enrollment for this membership is only open through October 1st, at which point it closes…until next year. Last week, I gave you just 24 hours to try The Modern Mystery School for one week for only $1. Did you miss that chance? Well, here it is again… One. Last. Time. Try the Modern Mystery School for 7 days for only $1. I hope you take this opportunity to check out the membership and join the many others in the tribe of Modern Mystics who are studying chakra therapeutics, learning astrology, diving into yogic myth, and much more! This week, I wanted to give you a little sample of what we dive into in one of the courses in The Modern Mystery School (and, one of our favorite topics as Modern Mystics! ): Astrology 101. On my weekly Facebook Live I took you into the essentials of astrology, gave you the basics of how it works, and one fun way you can apply it to your life right now. 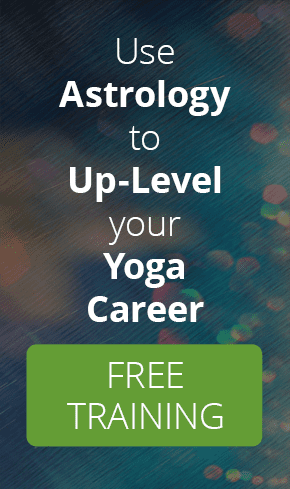 If you’ve ever wondered about astrology, or why it is so relevant for us as yoga and spiritual practitioners, you won’t want to miss this broadcast! You can watch the replay below. What is your favorite Modern Mystical tool? Join my free Facebook group and tell me your favorite (common or not-so-common) mystical practice! I want to get to know you better because you’re an essential member of my tribe. The FB group is the perfect place to do that. I’ll see you there!